Review of book three House of Eire - HERE! When a powerful California developer collapses at a funeral, Hillary Broome's caught in a network of jealousy, greed and secrets that could topple financial institutions and destroy families. In the midst of deciding whether to elope with detective Ed Kiffin, she's forced to investigate suspected foul play from disgruntled home-owners, mortgage bankers, and family members spiraling downward into homicidal madness that puts other lives in danger, as well. House of Dads is book two in the Hillary Broome series by author June Gillam. It opens several years later at the start of a funeral for a big property developer who also is a distant relative of the main character - Hillary Broome. Broome is in attendance accompanied by detective Ed Kiffin who is now her fiance. 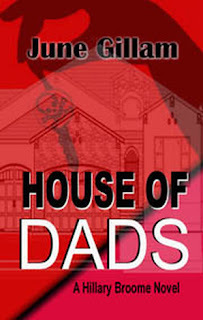 Unlike book 1 where the killer is a little more on the psychotic side of the fence, House of Dads follows a more traditional killer. Foul play is expected in this death and the list of possibilities very long. The plot is winding and full of twists as Hillary looks for the truth behind the murder. Her search involves a second death, connecting with disgruntled home-owners and mortgage bankers, and a look into the family's power struggle. Who will lead the company business and will more people be murdered before all is resolved. Gillim has a great writing style and wonderful characters. My one issue in book two is the story line gets a bit over complicated at times. There are a few side angles that Hillary briefly explores that are left hanging - mold, mortgage bundles, etc. They are introduced without really having an influence on the story line. That said, the book was an easy, enjoyable read and I do love my heroines with a few flaws.